Have you ever seen a small star-shaped orchid that looks as though it has a very long tail? If you have, you were probably looking at Angraecum orchids (pronounced ann-gray-come) . The most famous of all is Angraecum sesquipedale, commonly called the Comet Orchid. The name refers to the flower’s star shape, and from the very long tail (spur) at the back of the lip. This spur is actually the nectar tube and can grow up to 12 inches long. In 1862, Charles Darwin, the famed naturalist, took one look at this beautiful orchid with the long tail and wrote, “. . . in Madagascar there must be moths with probosces capable of extension to a length of between ten and eleven inches!” Since the nectar can only be found at the far end of the tube, pollinating a flower with such hard to reach nectar would seem almost impossible. Yet, the flower flourished. Over 41 years later, the long-nosed moth was “found”. The hawk moth (Xanthopan morgani praedicta) is the sole pollinator of these plants. The comet orchid is only one of over 200 species of Angraecum orchids. Native to tropical Africa and Madagascar, these plants vary widely in flora and vegetation. The stem is usually upright or slightly curved, and grows as a single entity. Leaves can be fleshy or leathery and fan out from higher up the stem. Roots are extensive, and most often lie flat along the top of the growing medium. Unlike many orchids, Angraecum orchids do not produce pseudobulbs. Instead the flowers grow from the leaf axils. They are produced in clusters of star-shaped blossoms and are usually white, but can be yellow or green. Some plants produce large, showy blossoms, but most blooms are small to miniature. Many of these orchids also possess a wonderful fragrance. All Angraecum orchids possess the distinctive long spur (comet’s tail) at the back of the lip. 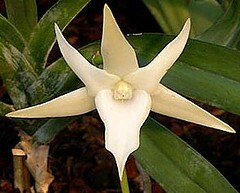 Angraecum orchids prefer temperatures between 60 to 80 degrees Fahrenheit (15 to 28 Celsius). They need to have even moisture, too, because they don’t have bulbs to store water. To maintain moisture, water the plants every 7 to 10 days and spray them with clean water on a daily basis during their growth season (late spring through early autumn). When they are not experiencing growth, spraying can be cut back to once every 10 to 14 days. Angraecum orchids are epiphytes and grow well in a pot or mounted on bark and extremely well in hanging baskets. Plants in pots should be grown in well-drained potting medium, such as tree fern fibers for smaller plants, and sphagnum moss or medium fir bark for medium to large plants. Place these plants in bright light, but diffuse it to protect the leaves from burn spots. The leaves provide food for the plant, so they need to be kept healthy. Most flowers want a snack now and then, but Angraecum orchids only crave food from April to September. A general purpose plant food is sufficient, and should be given at one-quarter strength with every third watering. Repot every two to three years in the spring and you’ve got all your bases covered. Give these orchids tender loving care and you’ll be rewarded with beautiful, fragrant blossoms for many years.